Seeing is Believing 12/7 – New Young Money, Kid Cudi, Gucci Mane, Triple C’s & The Game Videos! Continue reading to peep the videos! 2010 Full Grammy Nominee List! Continue reading to see the FULL list of Grammy nominee’s. Tags: Drake, Eminem, Jay-z, KiD CuDi, Mos Def, Q-Tip, T.I. Dope or Nope 11/18: New Consequence, Kanye, Common & More! The G.O.O.D. 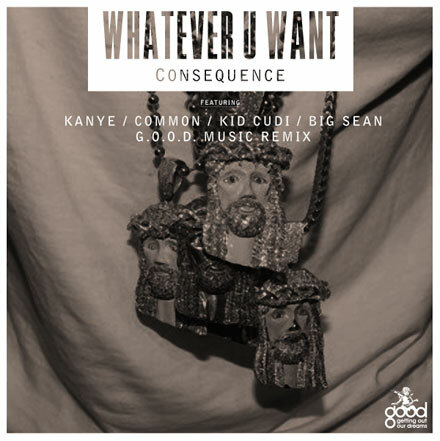 Music fam takes over Consequence’s latest single, “Whatever U Want”. The original version features production and a verse from Kanye and John Legend; but for the remix, Cons gets some help from Common, Cudi, and newcomer Big Sean. Consequence’s second album, Cons TV is slated to drop this year. To continue to set himself aside from other artists, KiD CuDi releases the abstract album cover for his debut album Man on the Moon. To compliment the space themed title, the cover features a side profile of Cudi fading into the Moon. The album will feature his current single “Make Her Say” with Kanye & Common, as well as his previous breakthrough single “Day N Night”. The album will feature production by Kanye West, Just Blaze, Swizz Beatz, and others. As far as guest appearances, Cudi has Snoop, Clipse, MGMT, and more for guest spots. Man on the Moon will be in stores September 15th on Dream On/G.O.O.D./Universal Motown. Continue reading to peep the deluxe album cover. Seeing is Believing 2/19: Day N Nite! I know this week Hip Hop A.D. seems like a music video blog. Coincidentally, dope videos have been dropping this week and I’m doing my job by spreading good stuff. Anyways, check out this new video by one of my favorite new artists KiD CuDi. This is a dope, artistic debut video for a hot record that I’ve been bumping for a minute. If you still don’t know who KiD CuDi is, open ya eyes and click here! His debut LP The Man on the Moon: The Guardians is coming soon. Seeing is Believing 2/17: New Kanye, T.I. & Timberlake Vid! Kanye & Cudi “Welcome you to Heartbreak, and the old T.I. is “Dead and Gone”! Tags: Justin Timberlake, Kanye West, KiD CuDi, T.I.